c308 Marketing maintains a long, successful partnership with Olgilvy PR. Often we've been called to construct complex websites under tight deadlines and/or significant pressure. These are three of c308's most notable projects completed for the PR jaugernaut. c308 was tasked with developing a digital hub for car buyers to find clean-technology vehicles. Everything was custom built. 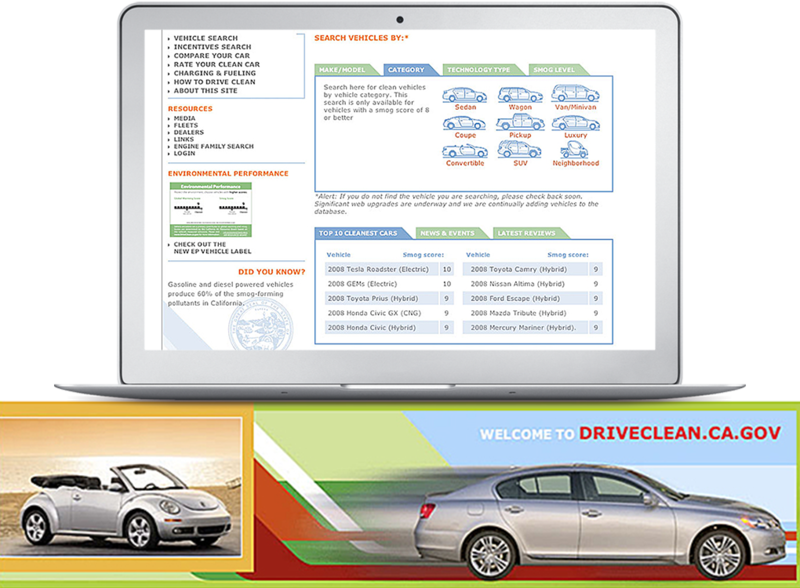 The website imports all of the cars registered in the state of California’s DMV, then allows the Air Resources Board to append those entries with their respective smog & global warming scores. Manufacturers can also add information about different makes and models. Fully designed and launched just two weeks after the initial phone call, this site was an exercise in crisis communications and has become an example of perfect implementation. 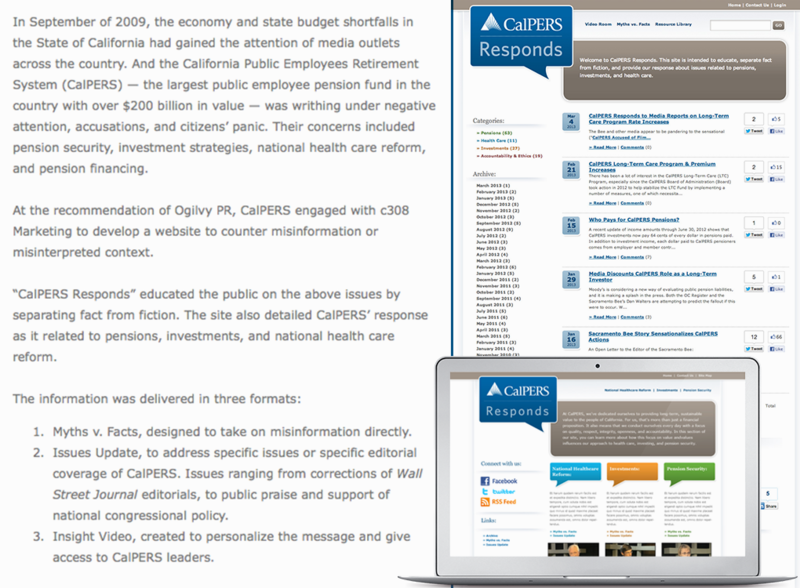 CalPERS Responds was leveraged to gain public trust and clear the CalPERS name. After those goals were accomplished the site was decommissioned. Honorably. Too Valuable Too Waste is a campaign hatched by Ogilvy as California’s response to the Plastics Make it Possible national initiative. Both are funded by the American Chemistry Council. c308 was commissioned to build the campaign's microsite. 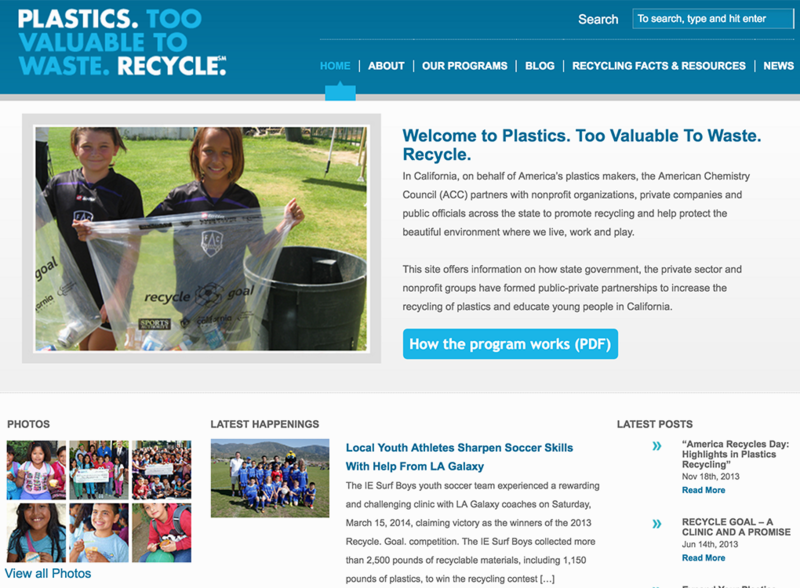 Designed to be easily updatable, the site accepts a steady stream of blog posts, photos from ongoing projects, and news hits spotlighting the state’s efforts to increase recycling efforts.